Computer Lab Hygiene. Hand sanitizers are being installed in each of the public facing computer labs to promote good hygiene. Security is important. Passwords should never be hand-written/visible to the public. In an effort to maximize security and minimize the number of post-it notes with passwords on them, we recently added SSO (Single Sign-On) to Banner Forms. Google announced and released unlimited storage on Drive for Apps for Education users. Backing up your data is important and now you have unlimited space to do so. Familiarize yourself with Google Drive and sync your data to the Cloud. Get to know your Google Apps. We’ve created Knowledge Base Articles to help you get to know your Google Apps (Gmail, Calendar, Drive, Docs, Sheets, etc.). You can now send us a text to inform us of an issue. However, we will not be able to reply via text. We will reply via email or phone call. Our number is: (240) 670-4ITS. The TV-setup in the former Leo Cafe has been modified so it can be used for presentations. You can now connect to it via AirPlay or a VGA cable. We have a new office located on the 5th floor in the O’Malley Library (OMAL 504). The CD/DVD drives in the classrooms have been mounted to the podiums. Each public computer lab has been reimaged. 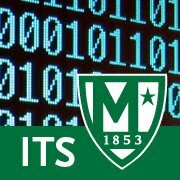 Each Manhattan College employee can purchase one Microsoft Office license for use on a personal computer at a discounted rate (approximately $9.95). For more information, see our Service Catalog or Knowledge Base Article about MS HUP (Microsoft Home Use Program). PaperCut has been installed in the computer labs, helping us monitor paper usage and promote sustainability. Over the summer, new desktops were installed in RLC 105, MGL 110, and the O’Malley Library. The best way to get in touch with a Client Services representative is an email to its@manhattan.edu or a phone call to x7973 (718-862-7973). Note that emails and voicemails for this line go to our ticketing system, so we encourage you to leave a message. Remember that we will never ask you for your password. We encourage you all to please reset your computer password to “jasper” prior to dropping it off at Client Services. If you do not do this prior, please allocate an extra 5 minutes to work with a Client Services representative so that they can assist you in changing your password when working with us. Upon completion of work on your computer, please allocate another 5 minutes so that a Client Services representative can assist you in changing your password back to its original state. This is necessary in order to safeguard your password. Remember that you should never give your password out to anyone under any circumstances. Note that the same procedure holds true when you are requesting assistance with one of your Manhattan College accounts. Client Services cannot lend out equipment to students. If a student needs equipment for a project, they must have a Manhattan College employee sign out equipment on their behalf, and the Manhattan College employee is held responsible for that equipment. Client Services can provide short-term loaner equipment, such as laptops and projectors by reservation. However, if equipment is needed long term, it should be purchased through your department. Please remember to request event setups in advance. We work with limited resources, so we cannot always complete last minute requests. Client Services currently has 3 convenient locations: Jasper Basement, RLC 103, and OMAL 504. Please stop by the location closest to you. We encourage you to call first to be sure that someone is available as we are continuously in and out of the office assisting the Manhattan College community.